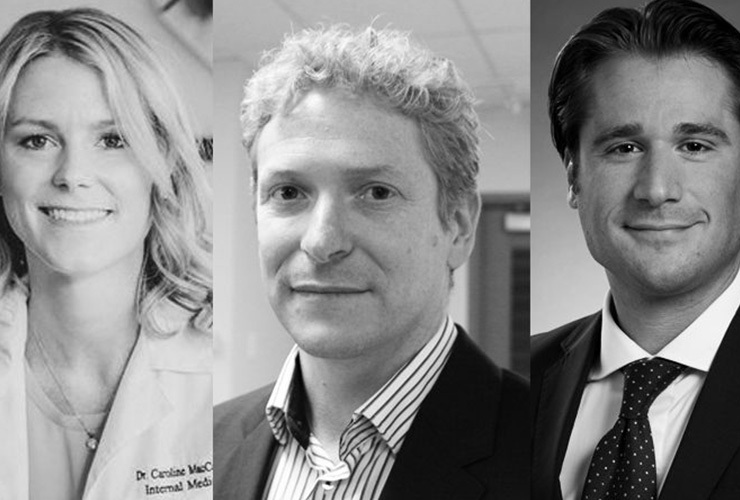 TORONTO, April 17, 2018 /CNW/ – Strainprint, the leader in cannabis data & analytics, is pleased to announce that Dr. Caroline MacCallum, Dr. Danial Schecter and Dr. Dean Elterman have joined its Board of Medical Advisors. Strainprint works closely with its medical advisors to support patients, enhance research and to advance the scientific understanding of cannabinoid therapy. With over 400,000 medical records and almost 7 million data points, and growing, Strainprint is the most trusted source for strain efficacy and patient use data. Dr. MacCallum and Dr. Schecter will jointly lead Strainprint’s Medical Advisory Board as Co-chairs and Dr. Elterman will focus on specific cannabinoid studies through the University Health Network. Dr. Caroline MacCallum graduated from UBC Internal Medicine Residency in 2013. She practiced complex pain in a number of clinics and hospitals in Vancouver including, Vancouver General Hospital Pain & Addiction Service, Change Pain clinic and BC Women’s Complex Chronic Disease Program. She is also clinical instructor in the UBC Department of Medicine, guest lecturer and preceptor for UBC Faculty of Pharmaceutical Sciences Program and the Medical Director for Greenleaf Medical Clinic. Dr. MacCallum has created online cannabis courses, CMEs, and preceptorships for physicians. She works with national committees to create cannabis guidelines and safe prescribing practices, as well as writing cannabis policy for hospitals and drug benefit plan coverage. She is qualified as a medical cannabis expert and has testified in arbitration. Her research interests include: cannabis for the treatment of complex medical conditions; cannabis for opioid and polypharmacy reduction; as well as cannabis and impairment. Dr. Danial Schecter is co-founder of the Cannabinoid Medical Clinic (CMClinic) and a practicing family physician. After working alongside some of Canada’s leading researchers in the field of medical marijuana, Dr. Schecter developed a strong interest in the therapeutic use of cannabinoids. As a recognized medical expert in the field of prescription cannabinoids and medical marijuana, Dr. Schecter has spoken at over 100 conferences both nationally and internationally and has developed educational programs on this subject. Dr. Schecter sits on a variety of cannabis advisory boards and consults internationally to key industry stakeholders in Australia, Latin America and Europe. In addition to cannabinoid medicine, Dr. Schecter’s clinical interests include delivering a high standard of care to at-risk elderly and palliative care patients, prompting him to establish his own house-calls service in Georgian Bay, ON. Dr. Schecter completed a fellowship in Hospital Medicine and is an active hospitalist at the Royal Victoria Regional Health Centre in Barrie, ON. Dr. Dean S. Elterman completed his medical degree followed by residency in urologic surgery at the University of Toronto. He has a Masters in Clinical Epidemiology and Health Services Research from Cornell and completed a 2-year fellowship at Memorial Sloan-Kettering Cancer Center and New York Presbyterian Hospital/Weill Cornell Medical College in New York City. Dr. Elterman is an attending surgeon at UHN (University Health Network) and an Assistant Urology Professor in the Department of Surgery at University of Toronto. He is the Medical Director of the Prostate Cancer Rehabilitation Clinic at Princess Margaret Hospital Cancer Centre and a clinician Investigator in the Krembil Research Institute at Toronto Western hospital. Dr. Elterman is chair of the medical advisory board for Molecular Science Corp. and has a particular interest in the study of cannabis and cannabinoid therapy. “All three of our new medical advisors are leaders in their respective fields and devoted to advancing cannabinoid research and therapy. We are so proud to be working with these great physicians who will help us to shape both the medical and recreational cannabis industries with real-world, real-time, medical-grade data,” said Strainprint CEO, Andrew Muroff.